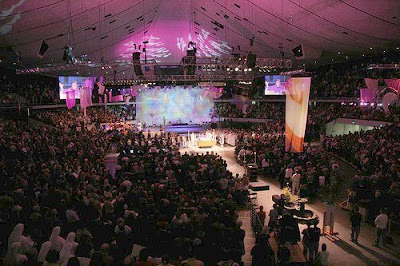 This Laetare Sunday will see the closing liturgy of one of Stateside Catholicism's marquee annual events: the archdiocese of Los Angeles' Religious Education Congress. Per custom, in excess of 40,000 catechists, clergy, communicators, rank-and-file faithful and assorted other hangers-on have taken over an Anaheim convention center and arena since Thursday for Masses, seminars and kaffeeklatsch in sessions large and small spanning the host of languages that have a home in the nation's largest local church. Oft-termed a "Catholic Disneyland" out of deference to the little theme-park down the street, this year's theme for the mega-gathering urged attendees to "Lift Your Gaze... See Anew!" Among the horde of speakers, blogosphere favorites Marty Haugen and David Haas presented two seminars each, as did the former master-general of the Dominicans Timothy Radcliffe OP and America's Jim Martin SJ; the National Catholic Reporter's John Allen addressed the future of "liberal Catholicism" and, in an ecumenical turn, the "blue" Christian commentator Jim Wallis talked up a "great awakening." This year's English-language keynote was delivered by Fr Robert Barron, a systematic theologian from Chicago's "Enchanted Forest" -- or, as it's officially known, Mundelein Seminary. Outside its doors, the event's also well-noted for the traditional(-ist) theatrics of protesters who show up to decry, well, more things than they don't. An annual highlight of Congress is Cardinal Roger Mahony's tandem of web-chats: first with local schoolkids, then a wider group in the archdiocese and beyond. After telling the children that "each one of you is a celebrity when you love Jesus," in this year's latter session, the Congress' founder and driving force (who John Paul II memorably nicknamed "Cardinal Hollywood") addressed topics ranging from Pope Benedict -- who he termed a "humble genius" -- and the late labor leader Cesar Chavez (with whom he marched as a young bishop), to Faithful Citizenship, the need to "help" youth find their vocation... and even yoga -- which, the cardinal said, "works for anyone" provided "we keep our focus on our living and merciful love. "Meditation in any form always deepens our love with God," the 72 year-old prelate added. When one young participant asked Mahony "Is their anything against the Catholic church being more fun?" and whether the life of the church could better reflect that of "gospel churches... so kids will want to participate," the cardinal replied "Sounds good to me!" Making his first public statement on Robert Blair Kaiser's takeoff novel in which the Angeleno cardinal gets kidnapped by liberation theologians only to return as lead spokesman for American self-governance (autochthony) of the US church, the eponymous lead opined that "That book is wild fiction!! I have never read anything more bizarre in my life! Don't waste your money on it!!" Of course, that's just a long way of saying "Lift Your Gaze... See Anew!"